We usually try to eat seafood of some sort at least twice a week or so. If I'm running short on time or just behind in general (often), I'll just throw together something quick and easy - like garlic salmon. However, James got tired of our usual and requested something different. I thought about how I could make something different without needing unique ingredients or lots of prep or time. I thought about my options, but I kept coming back to caramelization. It's such a great way to bring additional yumminess to a dish! However, I sure didn't want to make some caramelized onions! They sure are yummy, but definitely not quick. I also wasn't sure about making some sweet salmon. Maybe something sweetly savory, but sweet salmon just doesn't work in my mind. So now I had sugar for caramelization, some salt for the savory, and I also threw in some pepper for good measure. 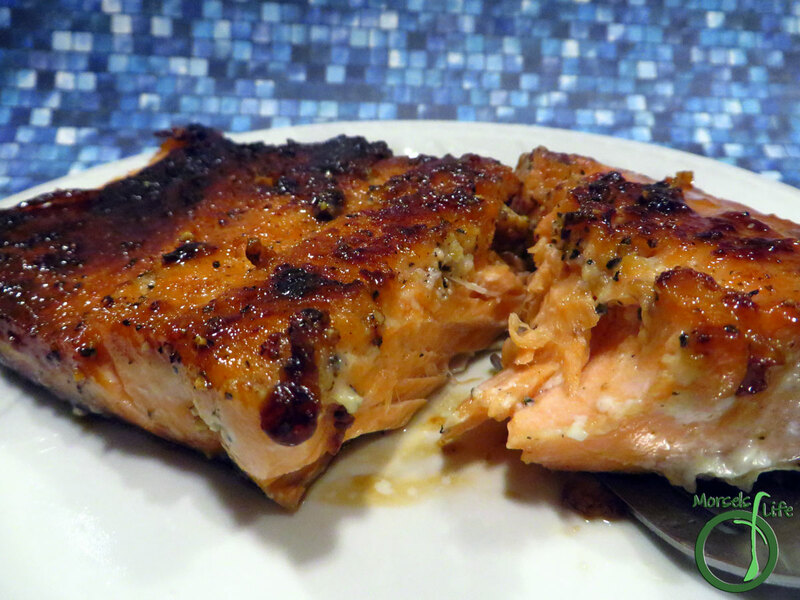 :) In the end, we got a sweetly savory caramelized salmon on the table in less than thirty minutes! Is it as quick and easy as our usual garlic baked salmon? No. 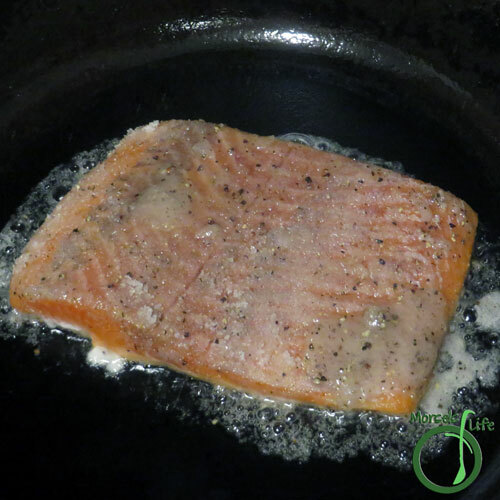 However, this caramelized salmon provides some scrumptious variety without taking very long or requiring any odd ingredients (just salt, sugar, pepper, and salmon). 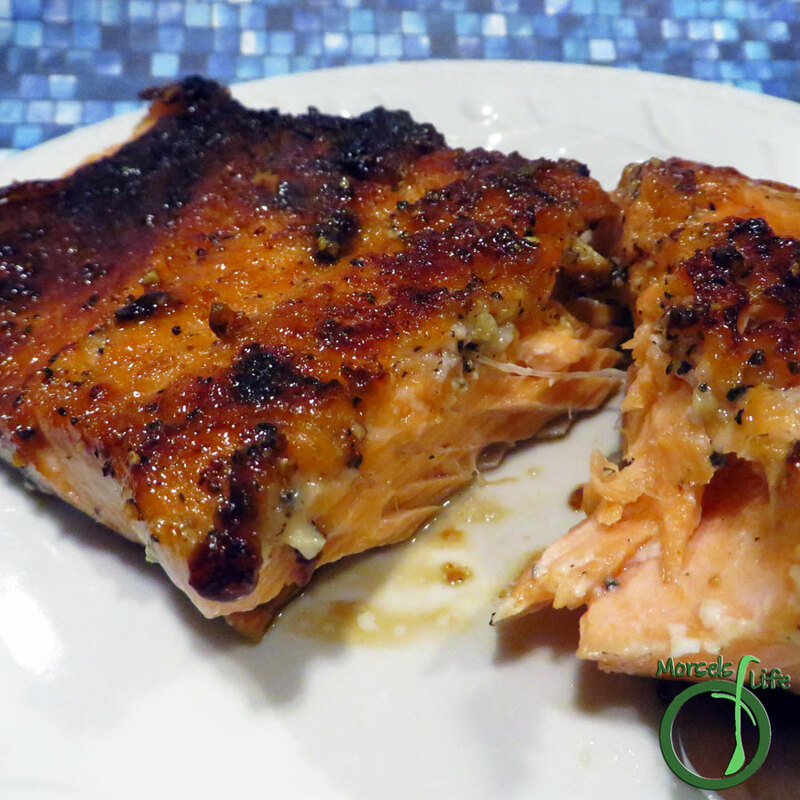 Now I'm thinking I need to make a big batch of caramelized onions and serve up this caramelized salmon with some caramelized onions! YUM! Do you have a "go-to" way of cooking seafood? What is it? 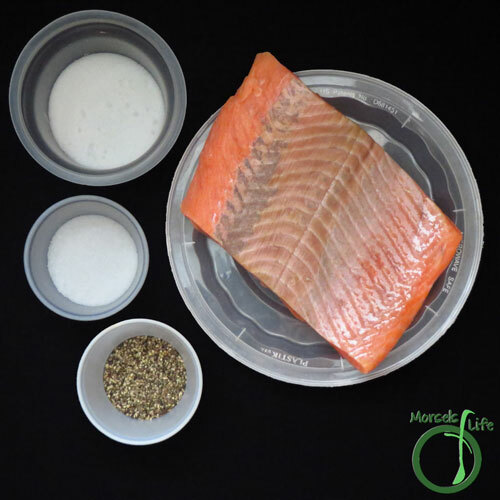 257 grams 9.125 ounces salmon fillet I used a skinless fillet, and I'd recommend one with the skin on. 2. Combine sugar, salt, and pepper. Dip each fillet into mixture, making sure to cover all surfaces. What an interesting idea! I am sure we would love it! Looks good. I'm not a huge fan of fish but I've recently discovered that I like salmon. Might have to try this method of cooking it. That really does look good, I am just trying to decide what to eat tonight, wish I had some salmon. Oh well, I will Like it on SU. 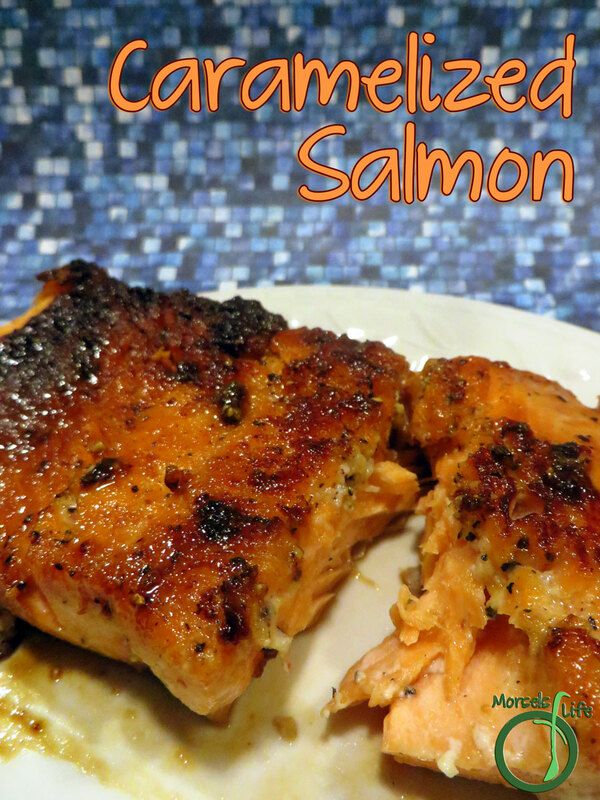 We like salmon too, especially since I find it's a bit harder to cook salmon wrong. :) Hope you enjoy! I totally just pinned it! It sounds so tasty! GAHHH GAHHHH!! SALMON + ME = match made in heaven!!! Couple of the CENTRY! LOL!! Waaayyy too much salt. I made it and knew immediately that it was damn near ruined. Smelled good looked good but salty. Just reduce the salt probably to a half tablespoon and it will be ok. Im very sensitive to salt can taste it in almost everything. Just a heads up. Thanks for letting me know your thoughts! It's possible we used different types of sea salt. Since the salt isn't really dissolved in this recipe, larger crystal salts will taste saltier, even if the same volume is used. 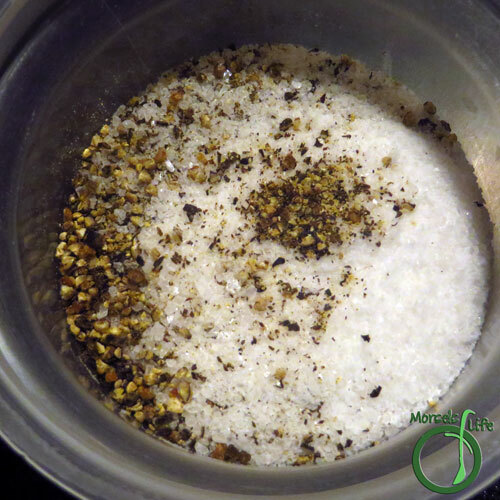 I used a pretty fine grind, and we enjoyed the level of saltiness in this recipe. Where is the garlic listed? I think it'd work well, as long as the grind was similar. :) If you give it a try, let me know what you think! I used pink Himalayan salt and it came out way too salty. I forgot how much more salty it was than regular salt...use sparingly. Interesting comments about salt. Most often I don't use it while cooking - I know that is heresy to many cooks. I only cook for myself but would hate to have someone drop in and not be able to have some due to health concerns. My favourite salmon recipe is baked with a topping made with tahini, yoghurt, lemon and garlic. My favourite seafood recipe is Baked Shrimp Scampi. I use less than half the amount of shrimp but at least half, if not two-thirds, the amount of sauce. That way I can use it on sides like pasta, baked potato, steamed broccoli or even hearty bread. I love to have leftovers of this or any other dish. My next meal might be exactly the same but may be totally different. Maybe new sides or just adding a bit to another dish. No matter how much I change or add to it, I consider it a "free" meal. I will be making this recipe without salt, sugar or pepper. At the table I would most likely add tamari rather than salt and omit the sugar. I don't want you to change your recipe but I know my preferences. I pinned it and the simplicity will ensure it is part of my "stable" of recipes. These recipes definitely aren't set in stone. :) I think it's good to know your preferences and then modify recipes to match! Your salmon and shrimp recipes look like they could be tasty too. Hope you enjoy! Salt,sugar and pepper is the recipe!